Hi there. My name’s Shawn and I’m a certified weather geek. Severe weather is an endlessly fascinating topic, but unfortunately it isn’t always easy to find engaging, accurate information. Myths and misconceptions and all sorts of other inaccurate information have a way of proliferating once they get out there, and I hope that this blog can be a place to correct that. While I’m a bit biased toward tornadoes, I’ll also cover severe weather in all its other forms. If there’s an event you’d like to see covered, or if you have any questions or comments, send me an email or tweet and let me know! Wherever possible, the material on this blog originates from primary sources — National Weather Service storm surveys and publications, original or reconstructed data and charts, scientific journals, first-hand accounts, contemporary newspapers, etc. If you notice any mistakes, please don’t hesitate to contact me or leave a comment. Also don’t forget to check the Resources page for a collection of learning resources, forecasting tools and other valuable links. And if you enjoy the contents of this blog, don’t forget to subscribe! The most thorough analysis of the Ivanovo-Yaroslavl outbreak. Interestingly, there was a massive long wave trough involved with this, not dissimilar from what we see with some of our more notorious events. I also was struck by the fact that dew points actually dropped before the first tornadoes formed, but nevertheless several factors overcame the lower dew points to produce tornadoes. This, to me, seems, honestly, like an event that only happens so many millenia or perhaps couple million of years. It definitely appears to have been an extraordinary event. I wish there were more information available in terms of photos & details of the damage. Everything I’ve read seems to lend credence to both of the significant tornadoes possibly being F5s though. I think, given the extremely sparse population outside of the few major cities, western Russia probably sees more significant tornadoes and outbreaks than we think. There are several potential moisture sources (especially the Black and Mediterranean Seas) and although favorable upper-air patterns aren’t exactly commonplace in that area, they do happen. That’s pretty much the problem with tornadoes. If a tornado fells a tree in the woods, usually nobody hears it. Even in the US with much higher population density, radar networks, the NWS, etc. we still have a pretty inaccurate tornado record because they need to strike something substantial before we can interpret how strong they were. If it interests you, the PDF file wasn’t something that showed up during my google searches until October of last year, because the French PDF seems to have 404’d a long time ago. I do believe that both of the F4s achieved F5 intensity, and more tornadoes that day that achieved comparable intensity, but they didn’t hit anything substantial, so there true potential was never realized. Given how recent this article is, maybe within another decade someone will be able to unearth damage photos and (hopeless optimism here) video footage. 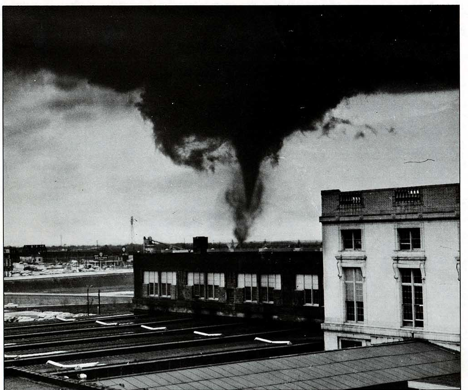 I do know that the Moscow metropolitan area seems to be in its own little “Tornado Alley” (not unlike St. Louis), but data on past events seems to be hard to come by, thanks to Soviet propaganda and bureaucracy (1904 Moscow tornado might be of interest to you). 1. The 320,000-kg crane and the 50,000-kg “water tank” (Could that mean tower? The term is a bit vague for me), being moved around really stick out to me. Is it possible that objects as heavy as that could be moved by tornadic winds, or are those deliberate exaggerations by the newspapers or scientific reports? If true, are these the heaviest objects on record being moved by a tornado? 2. What significant outbreak (in terms of geographical extent, intensity, and fatalities) does this remind you the most of? I mean outbreaks we know quite a bit about, not just older ones because information is hard to come by on them. From what I understand it was a water tower, yes. It would not surprise me to find out those reports were true. Obviously it’s a rare occurrence, but there is precedent for such a thing. The El Reno, OK tornado on 5/24/11 struck a 1.9-million pound drilling derrick, pushed it over and may have rolled it two to three times. The Tuscaloosa tornado struck a train trestle, where it ripped thick steel trusses weighing 34 tons each and threw one of them over 100 feet uphill. It also passed through a railyard and displaced 30 cars weighing approx. 35 tons each, throwing one of them about 120 meters. There have been plenty of other, similarly impressive feats as well. That’s a good question. I don’t know that there’s any recent outbreak that really reminds me of the Ivanovo outbreak. Obviously 4/27/11 is similar in terms of death toll, but that was the combined work of many, many tornadoes. The February 21, 1971 “Mississippi Delta” and 5/24/11 outbreaks come to mind because they featured several extremely intense tornadoes in close proximity, and in the case of the ’71 outbreak the death toll was quite high by US standards. But there isn’t one event that really jumps out to me. I noticed that quote too. That’s what I interpreted it as, but I’m not sure. People come up with all sorts of interesting ways to describe tornadoes, and most of them don’t make a whole lot of sense. You especially see a lot of those “the funnel shone/glowed” statements in historical accounts. Not sure what to make of it. The 1904 Moscow tornado is said to have shone from inside as well. Wonder if maybe it’s just something with violent tornadoes that occur in Russia? 1. Is the 1971 outbreak the one with two or three violent tornadoes with extremely long path lengths, that are now thought to have actually been tornado families? 2. Was the oil derrick just rolled/toppled over? There’s no evidence that it was fully lifted off the ground, correct? I guess the thing about the water tank (my guess is the actual tower part was detached from the tank itself) in Ivanovo that impresses me is that is was actually picked up and thrown 200 yards, which, given its weight, is much more impressive than just being knocked on its side or being bounced several yards (Not sure about the heavy water towers reputed to have been carried a kilometer at Kostroma, however, because there isn’t much information on that event as much as the one at Ivanovo). 3. In the one picture of the Ivanovo funnel, what tornado photos does it remind you most of? For me, the shape most resembles the one that occurred at Richmond, KY during the ’74 Super Outbreak, for some reason. Maybe it’s the narrow area at the bottom of the wedge. It also made me think of Richmond in the sense of looming near the edge of a large urban area. OK, these are the last questions I have about the 1984 Soviet Union Outbreak. P.S. One thing that I do know (I’m an amateur historian) is that several of the cities that were affected by this outbreak are historically significant, Kostroma is nearly 1000 years old. Sometimes I wonder if any ancient monuments, statues, or priceless works of arts were lost during this event (to me, history is even more fascinating when non-human intervention is involved, particularly with meteorological or geological forces). 1. There are several outbreaks for which that’s true, but yeah, you’re probably thinking of the same one. One F4 tornado in particular was originally measured at 202 miles, though it’s pretty obvious it was a family. There was also the Inverness F5, which was recorded at 109 miles in length, and another F4 just to the southeast that was ~65 miles. 2. It was blown over, bending the blowout preventer at a sharp angle, and then apparently rolled a few times. It isn’t as impressive as being physically thrown, but considering it was three times heavier (nearly two million pounds), I think it’s extremely impressive. And although I think the information for the Soviet outbreak could very well be accurate, we have no way to verify it. Since you’ve researched tornadoes before I’m sure you’ve seen how reports can be exaggerated. And that’s interesting about those cities, I didn’t know that. It’s fascinating to think of how many important artifacts, pieces of art, literature, etc.. have been lost through the centuries for one reason or another. In a way it makes it all the more impressive that so much history has managed to survive. First off, I got a new email, and since my emails on this stuff didn’t get through to you, I’ll just do an info dump here (you can delete it later if you feel it takes up too much space, I just recommend bookmarking the links first). I hope all the links work! 1. All of these websites were accessed through Google Translate. So, the translation is pretty rough in some places. 3. The (alleged) photograph of the Ivanovo tornado that appears in the French and English PDF files doesn’t show in any of these links. I should note that I’m not sure if Ivanovo was a single tornado or a family, based on the relatively long (reported) path length and when it truly reached maximum intensity, as not a lot of the damage photographs are exceptionally impressive. 5.	http://translate.google.com/translate?hl=en&sl=ru&u=http://ivgazeta.ru/%3Fmodule%3Darticles%26action%3Dview%26id%3D33758&prev=/search%3Fq%3Dhttp://ivgazeta.ru/%253Fmodule%253Darticles%2526action%253Dview%2526id%253D33758%26biw%3D1366%26bih%3D64 Newspaper article with one pic I haven’t been able to find anywhere else, and some statistics. 6.	http://translate.google.com/translate?hl=en&sl=ru&u=http://www.welkat.org/uragani-i-smerchi/184-ivanovskiy-smerch-1984.html&prev=/search%3Fq%3D%25D1%2581%25D0%25BC%25D0%25B5%25D1%2580%25D1%2587%2B1984%26biw%3D1366%26bih%3D640 Notable for having (reputedly) a photograph of the funnel and fatality statistics. From what I’ve been able to gather, the only fatalities that were counted were those that arrived at the hospital, so I’m sure many more deaths in rural areas went unreported, but it’s impossible to know for sure. 7.	http://translate.google.com/translate?hl=en&sl=ru&u=http://navolgu.ru/fish/forum/viewtopic.php%3Ff%3D45%26t%3D140&prev=/search%3Fq%3D%25D1%2581%25D0%25BC%25D0%25B5%25D1%2580%25D1%2587%2B1984%26start%3D10%26sa%3DN%26hl%3Den%26biw%3D1366%26bih%3D640 Online Russian forum, apparently mainly about fishing on the Volga River, but contains a Russian newspaper article of the event, with a photograph of the funnel. 9.	http://rutube.ru/video/42ad5c5440ccdfe9d2ea628a8818a61d The only video I’ve been able to find of this event (nothing on YouTube). No subtitles, unfortunately. Of note is what appears to be a large metal tank laying on its side. Whether it was thrown, bounced, or just slid across the ground, I have no clue. Sorry about the delay, John. I actually just responded to your email about half an hour ago. I suppose if you got a new email then you probably didn’t get it. Just in case I’ll re-send it to your new address. No biggie, oh, and #8 is not in the original email, something else I found later. I have a question for you shawn: Why tornadoes are becoming so common here in Brazil? like we are on the top 5 countries with the biggest number of reported tornadoes and some big ones are happening here like an EF3 that destroyed the industrial center of Taquarituba last year and in 2009 an EF4 tornado destroyed some power lines leaving 1,5 million peoples without energy. Also we had the first multi vortice tornado outside the USA. But what is scaring me is that here they don’t have a period that is more common to they happen, like, we have a lot of reported tornadoes that happened at 5 am of the morning and at night and most of these are rain wrapped, so we cant see they coming! Why this is happening??? Your English is just fine, Gregório. That’s a great question. Unfortunately, there’s so little known about tornadoes in Brazil (and elsewhere in South America) that it’s hard to answer. There has never been any kind of a record kept of tornadoes in that region, and in fact there’s still no official database. Also, many tornadoes go unreported since so much of Brazil is rural and unpopulated. So, we don’t really know how many tornadoes occur in an “average” year, and because of that we don’t really know whether tornadoes are becoming more frequent. There have been a lot more tornado reports in the last decade or so, but part of that is because of growing population. There are simply more people around to see tornadoes when they occur, and there’s more “stuff” in the way for them to hit. There actually has been a study that suggested tornadoes could be becoming more common in parts of Brazil due to changes in large-scale circulations, but it’s hard to prove without a reliable historical record. It’s certainly possible, though. And tornadoes can occur at virtually any time because there is so much heat and moisture available. There’s a low-level jet (basically a fast-moving river of air) that transports a lot of warm, moist air from the Amazon Basin south into the southern parts of Brazil, so it’s often warm and humid at all times of the day and night. And because there’s so much moisture in the air, tornadoes are more likely to be rain-wrapped. It’s sort of similar to what happens in the Southeastern US. Another factor is that many storms begin during the afternoon in Paraguay and northern parts of Argentina, and they travel to the east and often pass through Brazil at night or early in the morning. Sometimes there is more wind shear present in the southern parts of Brazil, and when that happens those storms can occasionally produce tornadoes. This is especially common in and around the state of Santa Catarina. I hope that answers your question. If you have any other questions feel free to ask! It was on my grandma’s house on a small city (only 600 habitants) I was doing some stuff on the computer when a really could and strong wind started. I went out of the house and I saw a beautiful HP supercell. (since her house is on the edge of the city I’ve got a clear view of the storm) and the wind became stronger. I went insede the house and soon after golf ball hail started to fall from the sky. than the wind became weaker and the hail smaller. The next day I went with my uncle to his farm and what we saw was a damage of a possible tornado. the house was without the roof and the saddler was totally destroyed. but was a beautiful experience to see that big storm coming with all those cyan tones on the rain core. Shawn, thanks for replying to my Tristate Tornado post. I read in that comment thread you were considering other meteorological events, including blizzards. I’ve tried to find information on the 1972 Iran Blizzard but there is surprisingly very little in line. Are you aware of any books or detailed analysis of this anomalous event? Hey Gerardo! That’s an event I’ve tried doing some research on as well, but as you said, there’s frustratingly little information out there. At least, not in English. You may be able to find some stuff in Farsi or another language, but I don’t speak any of those, so I don’t know. Quite an extraordinary and terrible event, though. Hey Tylor! I’ve got a few posts I’ve been working on for quite some time now, but life keeps getting in the way. I’m trying very hard to get a new one up by early March to coincide with the anniversary of the event I’m writing about, so I hope it won’t be much longer. And that 1908 Dixie outbreak is a fascinating event for sure. I had saved quite a bit of research on the event a few years ago, but I lost it all when my hard drive died. It’s on the list of events I’d eventually like to tackle, though.